Another new company with a treatment for wet AMD has come out of “stealth mode”, and presented information on how it’s system works and the results of it’s initial clinical trials. Here is an in-depth presentation of the Oraya IRay radiotherapy system. Over the past few years, several drug-based treatments have been suggested and tried to prevent visual loss due to neovascular age-related macular degeneration. Two anti-VEGF drugs, Avastin and Lucentis are now available to prevent significant vision loss in a majority of wet-AMD patients who are treated. However, it appears that repeated intravascular injections over an indefinite time period are required to keep the disease at bay. One promising approach to reducing the number of injections needed is the synergistic use of radiation in conjunction with intravascular injections, to prevent the proliferation of vascular tissue and to induce visual acuity gains. The idea of using radiation as a treatment modality for wet AMD has been around for years, but its use has been limited due to the potential damage that can be done to sensitive tissue within the eye without localization of the radiation beam and treatment area. Two companies now claim to have systems that achieve that aim. The first of the two new therapy systems is the NeoVista Epi-Rad 90, which involves delivery of a target dose of 24 Gy of beta radiation to the center of the choroid neovascularization (CNV) following a partial vitrectomy for placing the strontium 90 tip close to the choroid. Several controlled clinical trials with this system are currently underway to determine if the combined use of radiation therapy and anti-VEGF injections can result in AMD control with fewer injections, compared to drug use alone. Now, a second, office-based system has been proposed and is in early stages of testing. This is the Oraya IRay system, that uses a table-top source of low-energy X-ray beams, directed through the sclera onto the macula to treat CNV secondary to AMD. Unlike the NeoVista system, the Oraya IRay system delivers three doses of highly localized low energy X-ray radiation to the macula non-invasively, using a robotic positioning system, targeting algorithm and a device, I-Guide, for eye stabilization and motion detection. This office-based procedure can be performed in about 10-20 minutes, under a topical anesthetic. The IRay device delivers three beams of up to 8 Gy each through three different locations on the sclera (roughly at 7 o’clock, 6 o’clock and 5 o’clock), delivering up to 24 Gy to a single spot on the macula. The unique method of delivering the three beams of radiation to the macula was chosen to avoid other sensitive eye structures such as the lens and optic nerve. In addition, the angle of the beam path minimizes collateral damage to radiosensitive structures, while enabling the delivery of the appropriate dosage of radiation (24 Gy) to the choroidal neovascularization that was found clinically useful in the NeoVista studies. The IRay system consists of three parts: the robotically-controlled X-ray generation and eye imaging workstation (Figs. 1-3); the I-Guide, which is coupled to the patient’s eye via suction, and aligns and optically connects the eye to the X-ray generator (Figs. 5, 6); and the adjoining shielded operator workstation (Figs.3, 4). 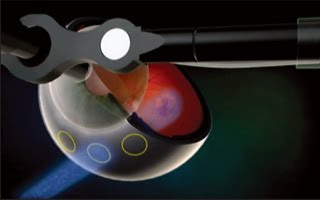 To minimize the effects of eye motion during therapy, the I-Guide is used, which consists of a contact lens coupled to the eye with syringe-generated suction, and attached to a central post. The post is mounted to a stabilizer bar via a ball joint. The purpose of the I-Guide is to steady the eye and act as a target for the imaging system to monitor the eye’s position and gaze angle. During treatment, the automated positioning software continuously evaluates the deviation of the eye from nominal. Motion of the eye already is substantially reduced by the I-Guide and is monitored in real-time using a two-camera imaging system. When necessary, the beam is automatically gated off by an algorithm that incorporates time as well as displacement, allowing brief eye excursions while still maintaining effective targeting. The I-Guide is designed with a breakaway feature that allows emergency exit of the patient from the system. Targeting is achieved on the basis of a calculated position of the fovea, as determined by the simple geometric relationship of the center of the I-Guide lens to the back of the eye. Oraya determined its targeting algorithm based on extensive pre-clinical studies, mathematical modeling of the eye, and subsequent developmental work. Pre-procedure fundus imaging, obtained via spectral-domain OCT, is used to verify targeting and ensure that patients with “outlier” fundus anatomy are identified. In performing the procedure, the operator, after protecting the lower lid with a specially designed self-retaining retractor, places the I-Guide on the anesthetized eye. The patient’s head is secured in a chin rest/head restraint, which incorporates a radiation shield. The operator at the shielded operator workstation obtains a visual lock on the eye and applies the appropriate X-ray dose to the three designated spots on the sclera. The three 3.5 mm collimated X-ray beams are sequentially and automatically delivered to converge onto a single 4 mm target spot on the fovea (Figs. 7-11). This office-based, low-voltage (100 keV) X-ray radiation therapy is a 10-20 minute procedure with no appreciable external shielding required. For patients, the exposure is comparable to the radiation received in getting an X-ray of the head and neck. For operators, the radiation exposure would be equivalent to ~0.14 mrem/hour or one-quarter of the radiation from a transcontinental airline flight. Each patient would get just one lifetime dose, not repeated exposures. Even though doctors might experiment, after FDA approval, with pulse or repeat dosing at some interval, Oraya is not studying repeat dosing at this time. There are three clinical trials planned. The Phase I Trial (CLH001) has been initiated and is fully recruited with over 60 patients to having been treated at either 16 or 24 Gy. The Phase I trial is a pilot study to evaluate the safety and tolerability of the IRay stereotactic, radiosurgery system in patients with Choroidal Neovascularization (CNV) secondary to AMD. The study aims to determine safety, preliminary efficacy, and dose evaluation. The study includes two cohorts: those without previous treatment and those previously treated with anti-VEGF therapy requiring additional treatment due to persistent or recurring disease activity. The initial results, on 28 patients with up to a year followup, treated in Mexico City, were presented by Dr. Peter Kaiser of the Cleveland Clinic Foundation at the Retina Sub-Specialty pre-meeting held prior to the main 2009 AAO Meeting. Dr. Kaiser reported on patients treated with 16 Gy of radiation plus Lucentis (following two monthly injections) in 15 anti-VEGF-naïve patients and in 13 prior Avastin or Lucentis patients (who had had on average 2.9 injections prior to entry into the study). There were no device-related serious adverse events and no evidence of radiation-related abnormalities, but there were a few device related adverse events, all superficial keratopathy − which Dr. Kaiser attributed mostly to placement of the I-Guide. These superficial events required no intervention by the physician. The results of this feasibility study, while meant to evaluate primarily safety and tolerability of the IRay therapy, demonstrated a number of encouraging efficacy signals, including substantial preservation and gain of vision in both the treatment-naïve and previously treated cohorts, as well as low numbers of required anti-VEGF retreatment injections. The rate of the anti-VEGF retreatment injections (following the two mandatory “baseline” doses) was found to be only 0.9 per patient over 10 months, and ~56% of patients needed no additional anti-VEGF injections, while still demonstrating visual acuity preservation and gain at least comparable to that seen in other studies, such as MARINA and PrONTO, with much greater injection burdens. Dr. Kaiser concluded that IRay extends the durability of Lucentis, reduces the number of injections, and appears safe and effective. Oraya expects to enroll the first patients in a multi-center, randomized, masked, sham-controlled European trial before the end of the year, using a 16 Gy dose. (The company continues to evaluate the possibility of adding a higher-dose treatment arm.) It is expected that 8-10 sites in Europe will participate. Asked about the long-term safety of IRay, Taylor said, “I’d be the last person to say we have absolute certainty we know the outcome (with IRay). The comfort comes from the ample data and research from ocular oncology and from some early work done in radiotherapy for AMD that suggest the incidence of radiation retinopathy is low. Years of study in ocular oncology have given comfort that the doses here (are safe). We know that AMD has an inflammatory component to it, and we know that AMD causes scarring and building of lesions in the eye that don’t respond to anti-VEGF therapy. We also know that radiation is anti-vascularization and antifibrotic as well. Lastly, we know that if you combine an anti-VEGF agent with radiation, you get a synergistic effect”. Taylor explained that radiation works best on concentrated lesions in an atmosphere of oxygenation. So, stopping leaking capillaries with an anti-VEGF, tends to make the center of the lesion more robust, and a better target for radiotherapy. Oraya has worked with radiation and oncology researchers and experts around the world to determine the dose and the approach. The science looks good. And the radiation is not delivered through the cornea but through the sclera. Taylor said one advantage of IRay over NeoVista’s therapy is that IRay is robotically delivered while NeoVista has a hand-held system. “We have a robot that is a wonderfully designed sniper, shooting low energy in tightly collimated beams with 3 beams going through the sclera at separate points, all converging at the same point on the fovea”. The IRay goal is to deliver either 16 Gy or 24 Gy to a spot centered on the fovea covering approximately 6 mm in diameter. 2. Continuous tracking and management of eye motion with the I-Guide. 3. 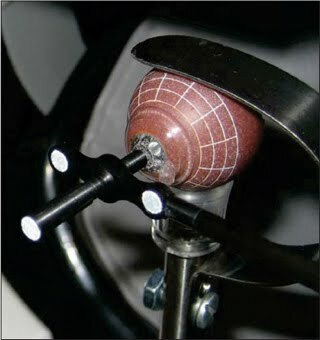 Collimation of the beam. Does IRay make financial sense for retina specialists? Probably, if CMS reimburses for it. There would be an initial machine cost plus a per-procedure disposable cost. Taylor believes the procedure will be cost-effective because it should reduce both diagnostic testing and anti-VEGF injections. IRay is not currently being tested in dry AMD, but that might be an area for research in the future, as drusen formation has been demonstrated to have an inflammatory component which may be amenable to radiotherapy. 1. 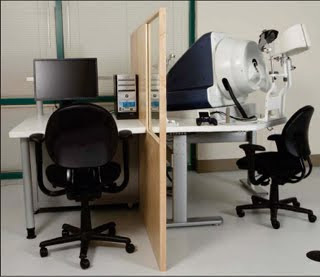 Office-based External Beam Radiation Therapy for Age-related Macula Degeneration; Hsu, Jason and Regillo, Carl; Retinal Physician, September 2009. 2. Stereotactic Radiotherapy for AMD; Taylor, James; Ophthalmology Innovation Summit, October 2009. 3. Motion Management for a Novel Ophthalmic Stereotactic Radiosurgical Device; Chell, E. et al; AAPM, July 2009. Thank you for this very helpful information. My husband was just diagnosed with wet macular degeneration, but since he is also at risk for a retinal tear/separation, it is not clear if he should have treatment, although there is still active bleeding. We are wondering if these new, less invasive techniques would allow him to receive treatment with less risk to his retina. Are there any physicians in the greater Boston area (we live in southern NH) who are involved in any of these trials? I have put this question to the company and hope to hear back from them shortly. Please send me an email (in the links section) so that I can send their reply directly to you. The company got your message and will respond directly shortly.